This Darts Quiz at gamerisms will challenge your Darts IQ. Go ahead; test your knowledge on the lingo, jargon and terms that are often used at the bars or at your local game with your friends. 1) What does Bag O’ Nuts refer to in a darts game? A. Lingo referring to a 100-point dart throw. B. Lingo referring to the snack you eat while playing darts. C. Lingo referring to a 45 point dart throw. 2) When darts players use the term Black Eye, what does it mean? A. Term referring to a shooter with a 'good eye' for darts. B. Term referring to racking up 50 points for hitting the center of the bullseye. C. Term referring to hitting the ring around the bullseye. 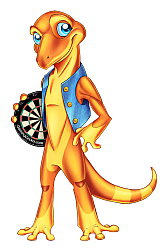 3) What does Clickity Click mean when referring to a dart game? A. Dart Lingo meaning a dart throw that missed the target. B. Dart Lingo meaning a dart throw that hit the bullseye. C. Dart Lingo meaning a dart throw that scored 66 points. 4) What does the dart players' term Flat Tire mean? A. Slang that means a dart ends up in the black area surrounding the board, thus no score. B. Slang that means the fletchings on the dart break during the game. C. Slang that means that your dart bounced off the board. 5) What is Shanghai referring to with the game of darts? A. When a player hits a triple, double, and single in the same row. B. When a player hits 3 bulls eyes consecutively in a row. C. When a player throws a wild dart that hits far away from the board. 6) What is a Spider or Spider Web when playing darts games? A. The bullseye that is marked in the center of the target. C. The bug that crawls around the bar spinning its webs. 7) What is the term, Hockey in reference to in a dart game? A. The dart that is being thrown at the board at the time. B. The line that you must stand behind while you throw. C. The actual dartboard that is being used in that particular game. 8) What does the dart players' term, Robin Hood mean? A. Dart throw that results in striking one dart onto the back of another already landed. B. Dart throw in which you throw two darts at the same time. C. Dart throw that results in two darts landing side by side. 9) What is a Diddle for the Middle in reference to dart games? A. The aiming motion to try to get a bullseye. B. The way that you determine the first player to throw by aiming for the bullseye. C. When you have two darts in the bullseye and are going for your third one. 10) What does the players' term Mugs Away refer to? A. When all players have a moment of cheering before or after the game. B. When you try to throw all of your darts at once getting at least 3 to stick. C. An announcement that losers play first at the next dart game. Darts Quiz Answers. Did you hit the bullseye? 1) C. Bag o’ Nuts: refers to 45 points for a dart throw. 2) B. Black Eye: rack up 50 points for hitting the center of the bullseye. 3) C. Clickity Click: lingo for 1 throw=66. 4) A. Flat Tire: occurs if a dart ends up in the black area surrounding the board, thus no score. 5) A. Shanghai: when a player hits a triple, double and a single in the same row. 6) B. Spider or Spider Web: the marked target areas located on the dartboard. 7) B. Hockey: refers to the throw line. 8) A. Robin Hood: dart throw that results in striking one dart onto the back of another already landed. 9) B. Diddle for the Middle: determining the first player to throw by aiming for the bull. 10) C. Mugs Away: announcement that losers play first at the next darts game.